On the water, on the ice, or on the street, LAST-A-FOAM® is at the core of top performance. Its excellent strength-to-weight ratio and material properties make it superb in recreational applications. LAST-A-FOAM® serves as structural core material in portable dance floors and in sports flooring used above ice rinks. Their light weight, coupled with their ability to absorb and harness energy, also makes our HDU foam cores a most valuable player in high-technology sports equipment. They are selected for hockey blades, kayak paddles, surfboards, skis, snowboards, fly fishing rods, skimboards and even pickleball paddles. In particular, LAST-A-FOAM® FR-4300 heat-formable foam is well-suited to composite panel cores and other structures with compound-curved surfaces or other details made with low heat-forming methods. 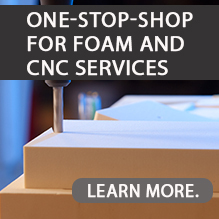 Even though this high-density foam is heat-formable, it is easily bonded, solvent-resistant, and accepts a variety of adhesives and coatings.